In a policy paper released today Zero Waste Europe warns against the use of landfill bans and advocates for the use of more effective instruments to reduce residual waste and advance towards a circular economy. The paper argues that most of the districts with landfill bans have seen an overcapacity of waste to energy plants, discouraging them to take further efforts on waste prevention, reuse or recycling. 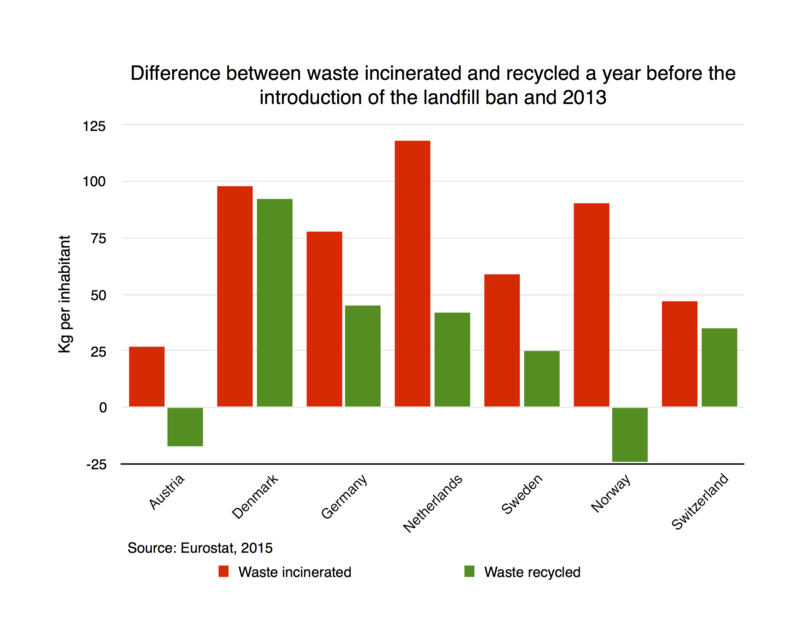 The policy paper analyses how in all 7 European countries where a landfill ban has been implemented it resulted into more waste being diverted towards incineration than towards recycling. This is the case in the Netherlands and Germany, where waste to energy incineration tripled and almost doubled the increase of recycling, respectively, and the case of Austria and Norway, where recycling has even decreased. In Denmark, the ban on landfill has seen a boost in incineration accompanied by a rise of waste generation of 37.5%. Zero Waste Europe also believes that landfill bans are a way to “bury” waste under other statistics without necessarily improving performance. In this regard, some European countries like Germany or Sweden claim to have a zero waste to landfill policy, but they actually landfill the rejects of mechanic-biological treatment plants and ashes from waste to energy plants. The paper also highlights that a zero waste to landfill policy is “blind” to waste reuse and reduction, for countries could continue to run a linear economy, increasing waste generation as long as waste is burned or recycled. Comparing two different cases, that of Copenhagen, where a zero waste to landfill policy is in place, and that of Treviso province, with a real zero waste strategy. The residual waste in Copenhagen is almost 6 times that of Treviso, where they don’t have landfill ban but a true zero waste policy to all sorts of disposal. In order to advance towards a Circular Economy Zero Waste Europe recommends to use equally high taxes on landfill and waste to energy incineration combined with a lower tax on landfilling of stabilised waste for they prove to be more effective in diverting waste towards prevention , preparation for re-use and recycling than a landfill ban. To download the Policy Paper, click here.